Fast-casual dining in Baltimore has taken off at a record pace, and we’ve been equal parts impressed and not-so-much with the various establishments trying to pull off this concept. 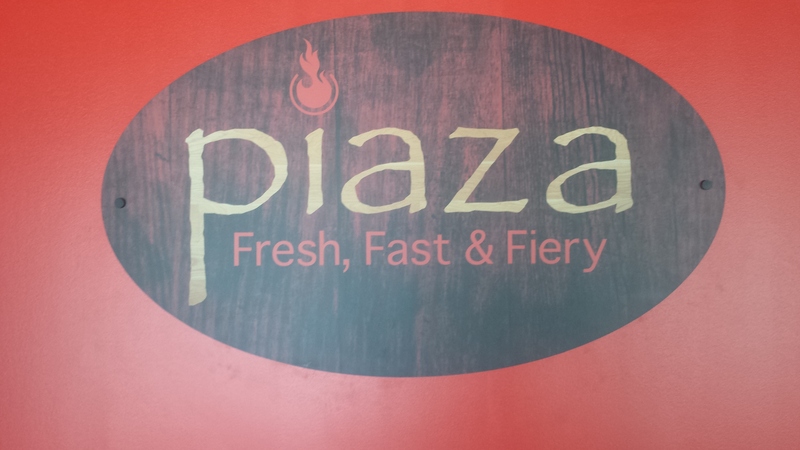 One that we’ve been most impressed with recently, though, is Piaza Fresh, a newer Italian take on the concept at McHenry Row. We stopped into the spot around noon on what started out as a quiet Sunday for the spot, and spread out at their dark wood tables with the backdrop of rustic wooden walls adorned with local photography of Baltimore. Pizzas hit the table first. 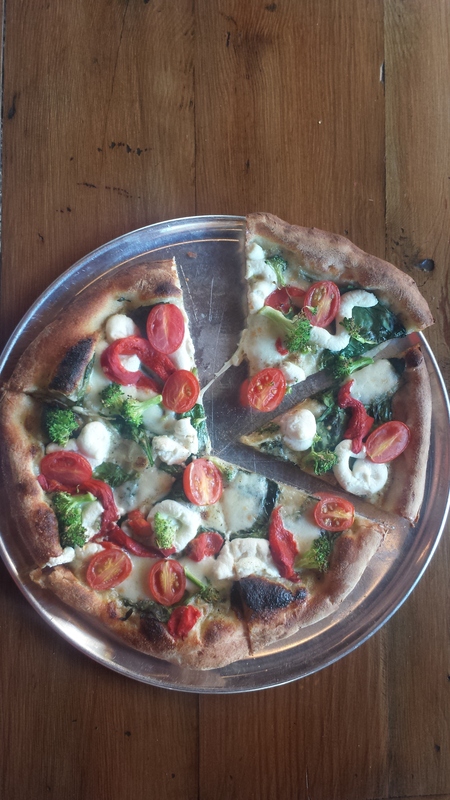 We ordered the Mediterranean (classic tomato sauce, mozzarella blend, artichokes, spinach, kalamata olives, roasted red peppers, feta, seasoned mushrooms) and the Red, White and Green (parmesan pesto, ricotta cheese, mozzarella blend, spinach, red onion, roasted red peppers, whole roasted garlic), one on the traditional crust, the other on rosemary garlic crust. Both pizzas were balanced in flavors and ingredients, but we were particularly impressed with the ability of the thin crust to hold up under the toppings. As for the crust flavors? Our four collective palates couldn’t distinguish between the two types. But maybe on simpler pizzas, flavors would be more noticeable. The piada came next. We shared it amongst us, but this could be a super-hearty lunch for one, or a share for two. 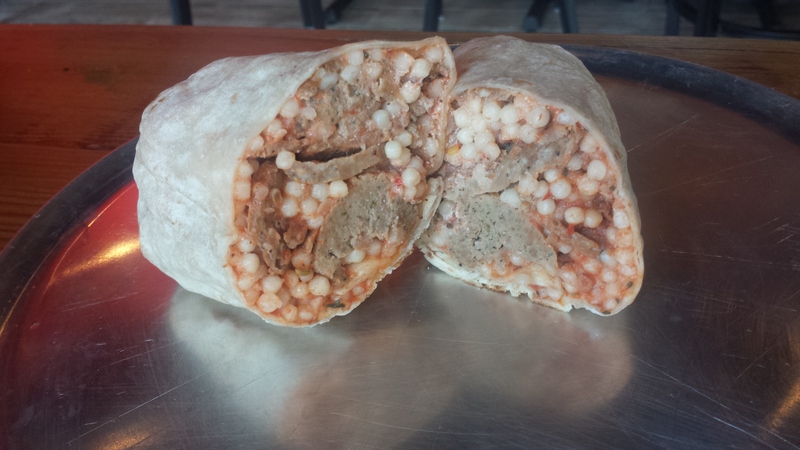 First, here’s the deal on the piada: It’s essentially a handheld (or, for us since we shared, a fork and knife) Italian burrito at Piaza Fresh (you can find different styles of piadas at different spots). Basically, for the Classic style, a tortilla-style thin flatbread is wrapped around spicy sauce with ricotta, meatballs, and Israeli couscous. Thick, juicy meatballs inside mingle well with the toothsome couscous. Our only advisory would be to get an extra order of the sauce – we loved it so much, we wished there was more inside. Steak salad was a win as well. Who doesn’t love steak that mingles with gorgonzola over greens and mushrooms and tomatoes? We might have liked the steak a tad more rare, but we’re picky when in comes to steak and for a fast-casual spot, this was far better than we expected. 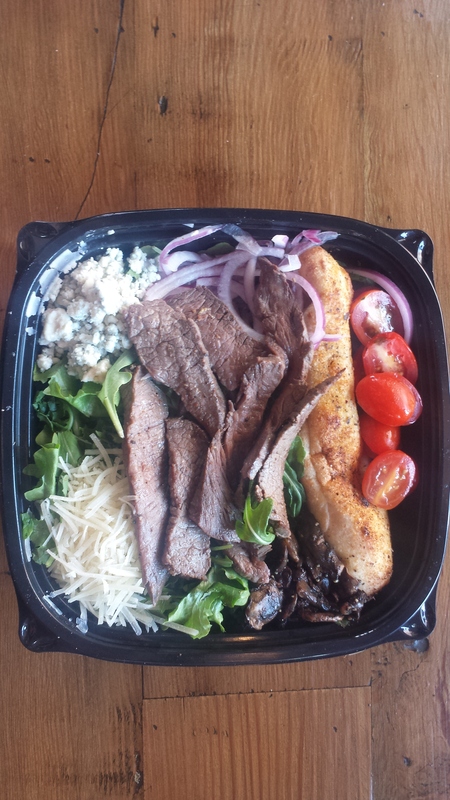 The salad and steak portions are generous, and the house dressing is something we wish to recreate at home. Also, the salad comes with a buttery herbed garlic bread piece that is worth fighting for. By the time we left, the place was filled with firefighters, yogis from next door, and families. We were glad we snagged our table when we did. Overall, Piaza Fresh is a win. And if you count in the no-corkage-fee, it should be on the top of the list for BYOB spots in Baltimore right now.